My baby is a hipster. I love this hat that my mom got him from American Apparel. It's finally getting warmer in Montana (by warmer I mean 40 or 50 degrees, instead of 20 or 30) so this hat is a great substitute for his warm winter hats. 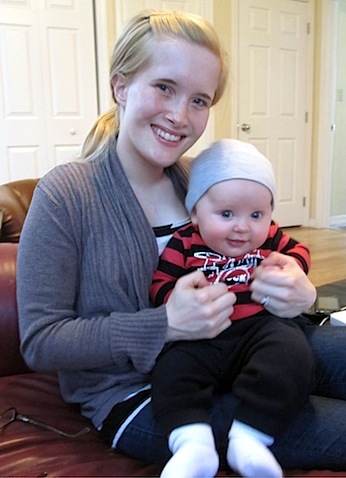 Typically I use hats to cover up my crazy hair days, but Nicholas doesn't have too many of those yet. While he's still rocking a strawberry blonde mullet, he has some nice blonde peach fuzz growing in up top. I keep begging my husband to let me snip off Nicholas's mullet. Instead of agreeing with me, Brian went and got himself a mullet as a way to stand up for Nicholas. Thanks honey. Now I don't want to be a controlling mother. I want to give my kids choices, like what sports to try, what clothes to wear (although I'm sure I'll cringe sometimes at their creative outfit choices), and who to be friends with. What I will put my foot down on is awkward haircuts. As much as possible, I don't want my kids looking back on photos of their childhood asking me, "Mom, why did you let me do that?" I have been a victim of terrible haircuts. I'm not sure how this happened, as my mom actually has an amazing sense of style. 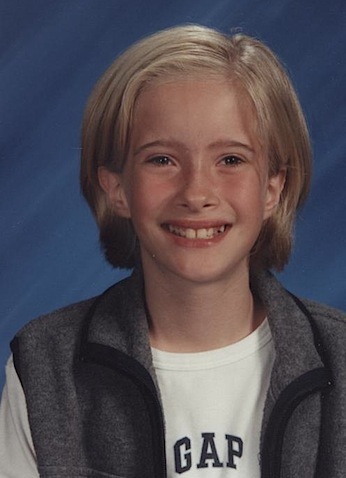 Why, my fashionable mother, did you let me cut my hair into these styles that made people (literally) ask if I was a boy or girl? I say never. Never will I let my children rock hair as awkward as mine. Case and point. This picture screams 90's, with my GAP t-shirt and fleece vest. And those eyebrows...oh the eyebrows. Aren't you so glad that hair grows? Is there a fashion moment in your life where you wish someone would have intervened? One of my sons wants a "Padawan braid." Uh, yeah, no. Sorry kid, a rat tail by any other name is STILL a rat tail. That is really funny! What is the obsession with rat tails? Sadly, my husband has rocked a rat tail one too many times. Let's boycott them!